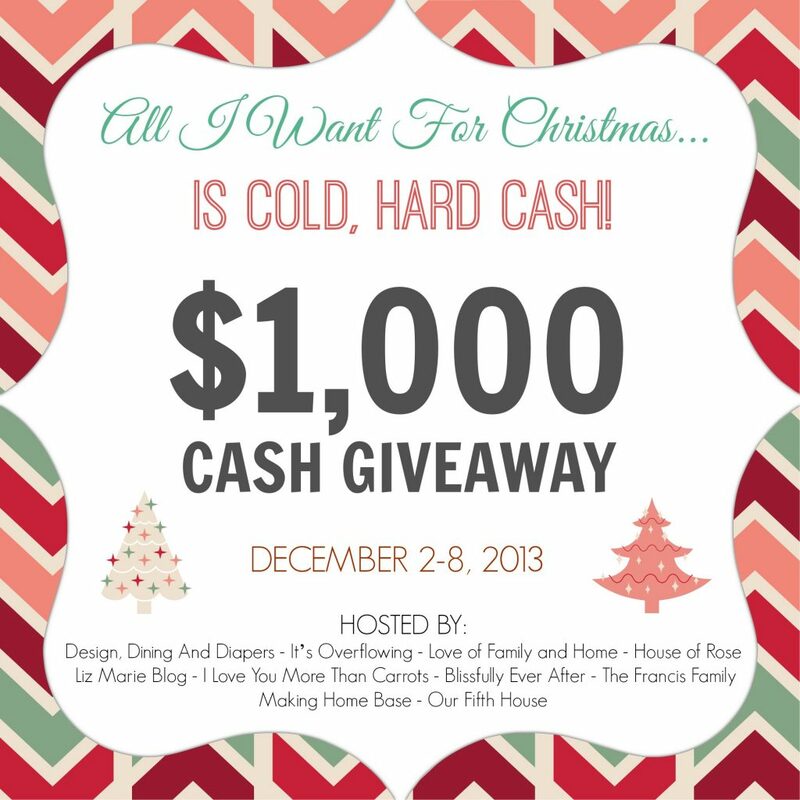 Remember last year when we did the $1,000 Christmas cash giveaway???? Welp. We are making it an annual thang’. Oh yes, we are. I would apologize for all the posts regarding your chance to win free stuff. Except I won’t. Because it’s FREE stuff. Just like last year, this our chance to give back to YOU ALL. The ones who support and encourage each of us to keep writing. Yea, I’m looking at YOU. I tell y’all often, but just in case you were feeling insecure…YOU rock my socks off. <—is that even a legit phrase? Speaking of rocking my socks….THIS group of women above has been a HUGE HUGE blessing to me over the last year. Just getting to know them and their stories truly has inspired me to be a better person. Please make sure to visit them! No purchase necessary. To enter, participants must use the Rafflecopter form above. This giveaway is in no way affiliated, administered or endorsed by Facebook. 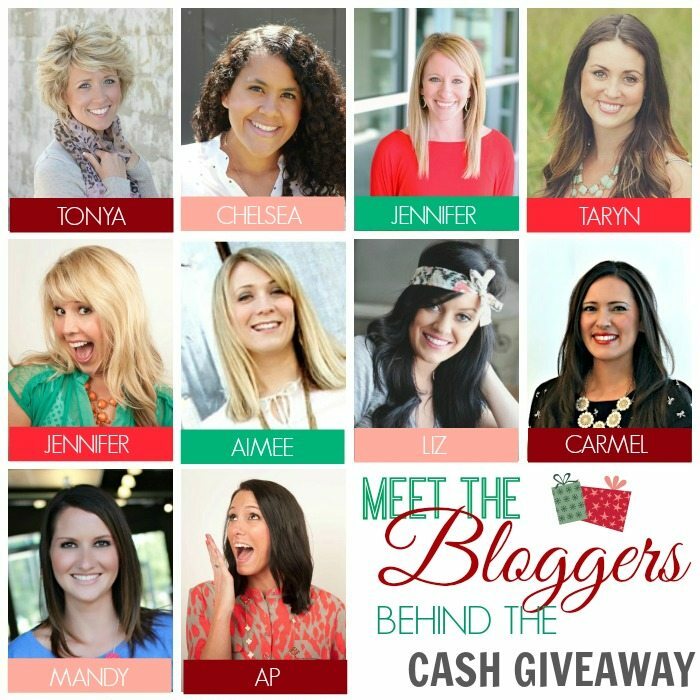 The giveaway closes on December 8th, 11:59 a.m. EST. The winner will be notified by email by 12/10/13 and will need to respond within 48 hours to claim their prize or another winner will be chosen. Winner must be 18 years of age or older and a US resident in order to win. Prize is valued at $1,000. Winners are responsible for paying any necessary taxes on winnings. Good luck!! I would put the money toward home improvements. Getting our heater fixed (we’re in California, but it gets cold here :)), new kitchen faucet and sink, etc. Thanks! I would put the money towards my parents’ 50th wedding anniversary party that we are planning for 2014. My parents are wonderful and they deserve a wonderful celebration of their love and 50 years of marriage! I would love to build my savings up! Adopt a family for Christmas!! I would bless my daughter with half of my winnings. She is a college student and need money for books. I would use the other half to pay bills. I’d put some into savings and use the rest for traveling over the holidays! have a debt-free holiday! woo too! have a debt-free holiday! woo hoo! My husband is ready to start his own law firm….by himself. Uhhhh…scary!!!!!!!!! $1000 would make this Christmas bright! I would pay off some bills and then finish remodeling our den. We are so close! I’m a new mom and would put the money towards a place of my own so my baby could have her own room! Thank you so much for this opportunity. You inspire me daily and I just love that you’re giving back. Merry Christmas! Some would go to savings and the rest I would use for growing my small business. My husband is working hard on going back to school and this would get him enrolled in Barber school and give him a chance to follow his dream! Hi Mandy! I would use the money to finish furnishing our home! That money can go a long way!!! $1000 can go a long way, even after taxes! I would love to adopt a family for the holiday and spend the rest on my own family. I’m getting married next year so it would go to that! I would use part of the money to help pay off the remaining balance on my wedding dress!! I am expecting in March, so I would save some and spend some on my new little girl. I would use it to pay off debt! If I had $1,ooo extra this holiday season, I’d do a few (small) house projects and put the rest of it toward taking my Godchildren out for a FUN weekend! Girl, I’d be putting that cash towards our adoption faster than you can say WHOA! I would use it for presents for the holidays. If I won $1000 I would use it to help pay for my midwife. I would use it to fund our trip back to my hometown to visit my parents and in-laws and help pay for professional pics of my girls! Help with the finishing touches for an Angel Tree family adoption, buy something small and sparkly for myself, and spend the rest on my family. They deserve it. $1,000 would be an amazing blessing to me. My car needs some work and I have some bills that I’d like to take care of. Thanks for hosting this giveaway! I would use it for moving expenses for our upcoming move! I would use to the money to buy my dad something special. This year my dad has lost his house to fire and lost my mom to cancer. I would use it towards Christmas presents for my kids. My husband had to have surgery unexpectedly and is missing a lot of work unpaid. This has put a serious hurting on our Christmas budget. I would buy my husband a ticket home for Christmas. He is in the navy and we can’t afford it right now. We would use $1000 for christmas presents for the family. It would be such a blessing. I would use it towards a new car! I would spend the money on trip back to Italy. First of how awesome of you ladies for the opportunity! This would be an answer to our prayers right now!! We have a 2 week old so I’m out of work for going on the 3rd month due to complications. My husband works for a steel mill and they have cut their hours down to almost nothing. We would use the money to make it thru this down time at work and not stress! good luck to everyone and thank you again for being so sweet and offering such an amazing giveaway! I would pay off all the credit cards from Christmas gifts. I would save some, adopt a family for the holidays, and spend some on my munchkins! Our home is in dire need of some repairs (we’re talking exposed plywood flooring here), so this would help immensely. Also, a friend is in the process of adopting a special needs child from China, and I would love to be able to share another chunk of change with her to assist their family in the adoption process. I would like to use for my son.